The UC Davis Microbiology Graduate Program, which accepts approximately 22% of applicants, has an incoming class size of about 10 students per year. Admission requires an undergraduate degree (B.S. or B.A.) in a biological science, which should include coursework in biology, chemistry, physics, and mathematics. Upper division courses in biochemistry, cell biology, microbiology, microbial physiology, genetics or immunology are also encouraged. 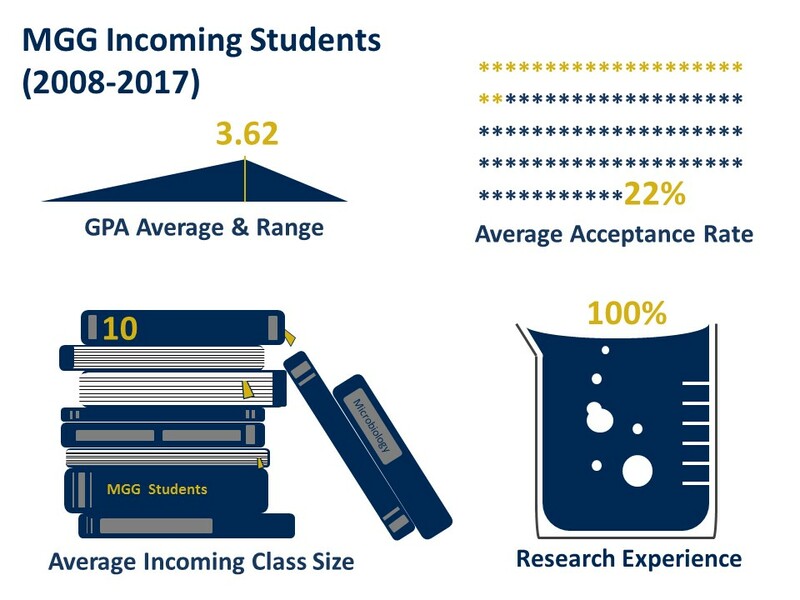 Applicants for admission to MGG are required to meet the University of California minimum 3.0 GPA requirement for admission. Students must also demonstrate an aptitude and enthusiasm for research, which should include active participation in an independent research project supervised by a faculty member and/or post-baccalaureate research experience. We are committed to creating a diverse student body, and welcome applications from underrepresented groups. A complete list of diversity programs/resources can be found online via Graduate Studies. Applications are accepted for fall quarter admission only. Applications must be completed by December 1st. Applications will be available in early Fall. Please use the following link to the Graduate Studies Apply Now Web Page to access the Microbiology Graduate Group application. The fee to apply is $105 (U.S. applicants) or $125 (international applicants) and may be paid by credit card or e-check. This non-refundable fee must be paid before the application will be considered complete, and the fee is required for each application submitted. In the prerequisite section of the application, please list all biology, biochemistry, and microbiology related coursework along with the received grade. Examples of course that should be listed include: biology, genetics, immunology, ecology, microbiology, bacteriology, virology, related laboratory courses, etc). Letters of Recommendation must be submitted electronically through the online application. Do not have recommenders send letters in hard copy as they will not be reviewed. UC Davis requires academic records from each college-level institution you have attended. You will be instructed to upload scanned copies of your transcripts after you have submitted your online application (for more details visit https://gradstudies.ucdavis.edu/submit-transcripts). Please use these codes for reporting electronic scores from the Graduate Record Examination General Test. UC Davis Institution Code: 4834 and Department code: 0212. TOEFL or IELTS - English language testing is required, not just for international students, but for all applicants whose native language or primary language of instruction is not English. UC Davis accepts both the TOEFL and IELTS examinations. Institution code: 4834 and Department code: 07. The graduate group cannot review an application until all of the above components are received. Inquiries concerning application procedures or any other aspects of the program and requests for forms for admission to graduate study should be directed to the MGG program coordinator. Prior experience essay: We would like to know about your experience in research and/or working in a laboratory, since this is critical for our admissions committee to assess your preparation for Ph.D. study. What were the goals of the research or lab work? What your role was in the research? What was it about this experience made you want to earn a Ph.D. in Microbiology? Future interests or goals essay: Ph.D. study is not just about obtaining a degree, it is a process of learning how to advance knowledge to benefit society, while developing a skill set that will prepare you for a variety of academic and non-academic leadership positions. What do you think you would like to do with your degree? What kinds of careers might interest you and why? Because of the increased costs associated with supporting international students, the Microbiology Graduate Group will likely not admit any international students unless they have their own funding. Therefore, international applicants are encouraged to secure an independent scholarship before submitting an application. Please consider this carefully before you commit to the application process. Top applicants are invited (all expenses paid) to UC Davis for a recruitment weekend, which is typically in late January or in February. Recruitment weekend is a great way to meet MGG faculty and students, learn more about the program, and see the UC Davis Campus. Our next recruitment event is currently scheduled for February 8-9th, 2019. The Graduate Studies Financial Support website is a great resource on fellowships, financial aid, and academic employment opportunities. Please note that prospective students can apply for fellowships by filling out the New Student Fellowship portion of the admissions application. 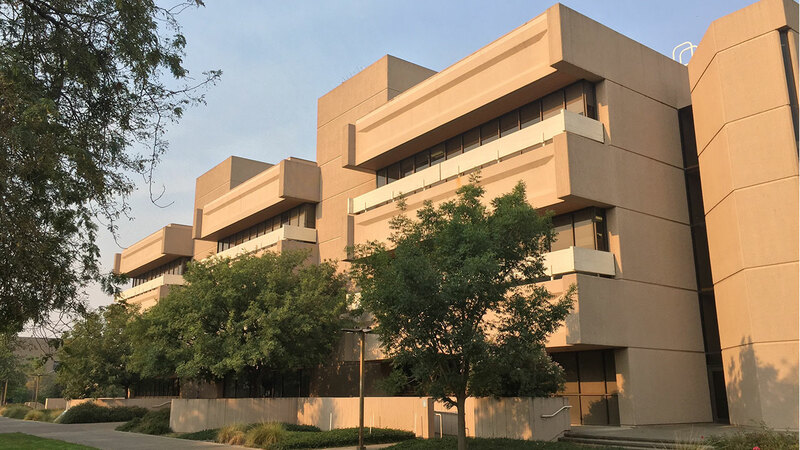 Tupper Hall is home to the Microbiology Graduate Group Office (Room 3143), which is located on the west side of UC Davis campus (Photo by Jessica W. Toan). The Genome & Biomedical Sciences Facility Building is home to six different core research facilities: The Bioinformatics Core, The DNA Technologies Core, The Expression Analysis Core, The Metabolomics Core, The Proteomics Core, and The TILLING (Targeting Induced Local Lesions IN Genomes) Core. 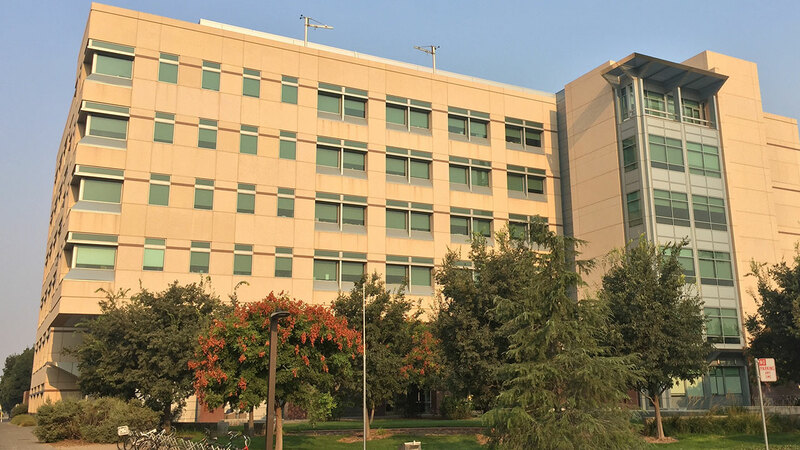 In addition, several MGG research labs from the Biomedical Engineering, Internal Medicine, Medical Microbiology & Immunology, and Pharmacology Departments are located in the Genome Center (Photo by Jessica W. Toan). 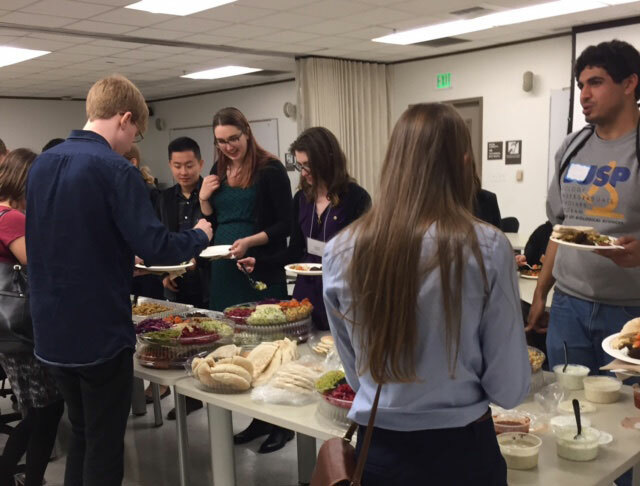 A Meet and Greet meeting between The Microbiology Graduate Group Student Association (MGSA) and The ASM UC Davis Undergraduate Chapter (Dec 2016, Photo by MGSA). Welcome to the incoming MGG Class (September 25, 2017, Photo by Jessica W. Toan)! 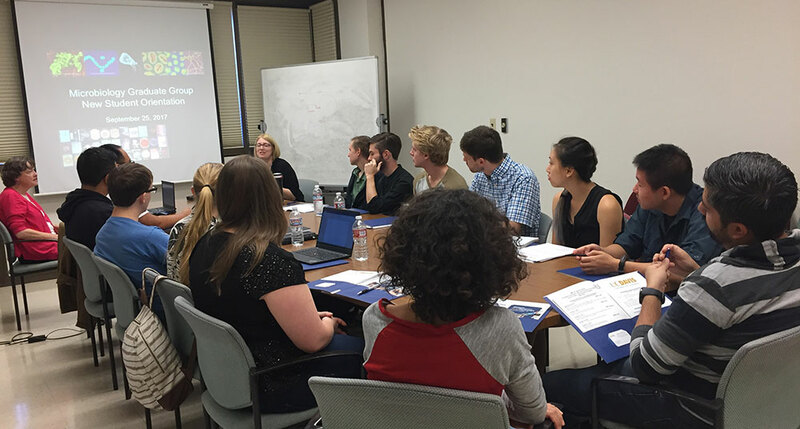 During recruitment, prospective students also get to talk about graduate school with current students over lunch. Special thanks to Hannah Starcevich and Jonathan Lin for planning (Photo by Jessica W. Toan).